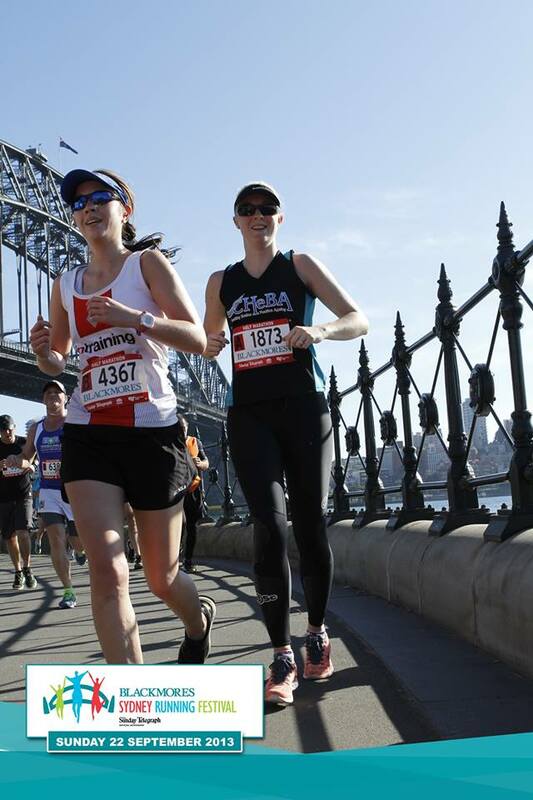 Last Sunday I competed in the Blackmores Sydney Running Festival Half Marathon, which I must say is my favorite course to date. My Sunday started when the alarm went off at 4.00am to tell me I needed to get up, eat and head for the train station, as my train was due at 4.44am and there was no way I was going to miss it. So I rolled out of bed, being careful not to wake the fiance and threw on my running gear. I had a some toast, a banana and a peppermint tea (which I’ve heard can settle the stomach). Then I jumped in my little Yaris and headed for the station. As I was parking at the station a couple of guys wearing running gear were also parking their car and we chatted as we made our way to the platform. It’s really nice how runners can just get along, we all have this underlying connection that it very hard to explain, the only way I can explain it is to say that other runners just “get it”. It’s one of the things I love about running. As I sat on the train I realised that I had forgotten my Nike GPS watch which really bugged me, but I knew I was really tired and things could be a lot worse (I could still use the App on my phone). You see, the day before the half marathon I played in a mixed volleyball tournament and survived. But I was worried that I was putting too much pressure on myself, so my game plan for the half marathon was to make it to the finish line in one piece. Beating last years time was never going to happen under these circumstances. When I arrived at Milsons Point on a train packed with runners of all shapes and sizes, I bumped into 2 runners from my Nike Run Club. It was great to have some pre-race banter with them. You could feel the excitement and energy from everyone as we plodded down towards the portable toilets….. oh, and the start line. After my toilet stop I met up with a fellow Fitness Ambassador from USW CHeBA and we had a photo in our charity singlets before the race. Lise was taking part in the marathon so she would be starting later than me and I wished her all the best. I told myself that I must keep an eye out for her as I planned to cheer on the marathoners after my race finished. For the first half of the race I got to run with 3 of my good mates from Nike Run Club, as I managed to catch them in the first km. So there I was with Todd, Janet & Karie (first timer) who I knew were all going to be pushing it for a time close to 1:50, this meant they would be going much faster than I thought I ‘should’ be going, but I would try and stick with them for as long as I could. There was pain, a lot of pain. My right knee was feeling dodgy and my shin and my calves were so tight and stiff….. it just felt horrible and like it was not going away. I knew it was self inflicted and I don’t like to complain, but it was very, very tough. Possibly even tougher (mentally) than my marathon, which is really saying something. I actually contemplated pulling out about 3-4 times but my stubbornness kicked in and wouldn’t let me quite. We Taureans are known to be stubborn, thank god for that!! So I managed to stick with my 3 mates for the first 10km, and then they started pulling away from me. I also had to make an urgent pit stop when I suddenly had the urge for a #2 (I know, too much information!) so I unfortunately spent about 3-4 minutes in the bathroom at the halfway point. But felt much better for it afterwards. I had to keep reminding myself that the goal was to get to the finish line in one piece, just get there. Just keep moving and putting one foot in front of the other. So I decided that I needed to take my mind of myself and use the others runners around me and the scenery to keep my mind busy not thinking about the pain. So I cheered on other runners & encouraged many people who had slowed to walk. I spotted some people I knew and cheered for them and chatted to them for a short time too. It seemed to help a little and before I knew it was heading back from Pyrmont towards the finish line at the Sydney Opera House. There was just over 3 kms to go…. and in that spot I got overtaken by a 2hour pace group. Not only was I shocked that I had a chance to make it in under 2 hours, but it helped me fire a rocket up my behind and get me moving to stay in front of them!! The final leg was in front of me and the crowds were gathered and cheering us all on, so I dug deep and sprinted to the finish line. My time was 1:57 and I was so relieved that this painful run was over. The tears welled in my eyes. I had made it. I had pushed through and kept going when everything was telling me to stop. That’s what I love about running, I had raced myself and won the mental challenge today. Who knows what tomorrow will bring? After the run I headed back to my work office to get changed and have a snack. Then I headed down to the 35km point on the marathon track to meet up with some friends to cheer on the marathoners. It is also about the 38km mark so we knew we’d get to see the runners again as they made the final dash to the finish. We knew so many first time marathoners and we were all so excited for them! Cheering everybody on as they came past was actually the highlight of my day, as I know how important it was for me when I had done my first marathon. It was an emotional day for me and I was overjoyed to see so many friends and run clubbers smashing their goals. It was beautiful to watch and I’m so lucky that I get to be friends with and run with such a wonderful bunch of people. This entry was posted in Race Days and tagged #running, blackmoresrunningfestival, halfmarathon by laurenhailey. Bookmark the permalink. hehehe I’m in this yay!